Along the Mid-Atlantic coastal plain, northeastern North Carolina stands out as a hotspot for lichen biodiversity. The black tendrils on this foliose lichen, Parmotrema perforatum, are cilia, and are thought to function as dew catchers. It’s possible that they also help the lichen latch onto a substrate if it breaks off, lichenologist James Lendemer says. Photo by Vitaly Charny/CC BY-SA 4.0. On a crisp, sunny morning in December, two rubber-booted figures are slogging their way through swampland north of Creswell, Washington County. One clasps a blue plastic ruler while the other scribbles on a makeshift notepad fashioned from a cardboard peppermint patty box. They’re investigating the trunks of certain trees, looking for particular patches of lichen — oft-overlooked organisms that are more like mini-ecosystems, teeming with life. “Okay, so which ones are we missing here?” asks Jessica Allen, carrying the ruler. “Twelve is gone,” replies her colleague, James Lendemer, referring to a spot on a red maple where a lichen apparently should have been. Allen and Lendemer are lichenologists at Eastern Washington University and the New York Botanical Garden, respectively. They’re here today, calf-deep in murky water, to check on the progress of a pilot study they began in late 2017. Their aim is to see how lichens are surviving after being removed from one location in the swamp, called Bull Neck, and transplanted onto trees at this site, about two miles away. “We were going for quantity, and we were going for diversity,” Allen says. All told, the duo transplanted more than 400 samples, representing about 100 lichen species — the most diverse lichen transplantation to date, she says. 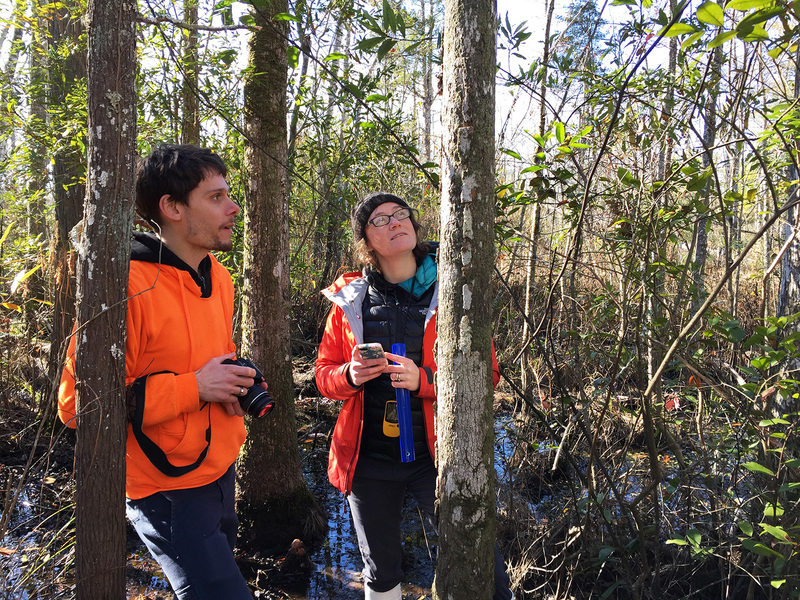 Lichenologists James Lendemer, left, and Jessica Allen are conducting a pilot study to see how well N.C. coastal plain lichens fare after being transplanted to new surroundings. Photo by Julie Leibach. The whole process took three days. Using wood chisels and a hammer, Allen and Lendemer extracted swatches of lichen-laden bark from select trees and placed them into pillowcases. Then they toted the samples down a dirt road to the new location. Using a staple gun or silicon sealant, they stuck the lichens onto trees in orderly columns. In some cases, the trees were the same species as those that the lichens had originally grown on. Other times, the team selected new species. “Our question was, will [the lichens] live? And then, will they grow off of these bark fragments onto the tree?” Allen explains. A transplant that creeps onto its new surface signifies that the species might be able to survive in that environment. Allen and Lendemer are interested in transplantation as a potential method of N.C. lichen conservation in the face of rising seas. As it turns out, areas in and near North Carolina’s Albemarle-Pamlico peninsula host the core ranges of many Mid-Atlantic coastal plain lichen species. Helping these organisms migrate inland could be one way to rescue them from habitat eventually lost to saltwater inundation, according to the researchers. Indeed, there’s growing evidence that the sea is rising faster north of Cape Hatteras than it is to the south, according to a 2015 report prepared by the N.C. Coastal Resources Commission’s Science Panel. To fully appreciate these unassuming organisms, a little lichenology is useful. While lichens might bring to mind primitive plants like mosses, they aren’t plants at all. At its very essence, a lichen consists of a fungus coexisting symbiotically with algae or photosynthetic bacteria called cyanobacteria — and sometimes with both. The resultant organism looks “completely different from the two constituent parts,” Lendemer says. The fungus benefits from the union by absorbing sugars produced by the algae or cyanobacteria through photosynthesis. In turn, the fungus provides shelter from extreme conditions, such as drought and intense sunlight. “They have a lot to teach us about how different organisms can live in close association,” says Scott LaGreca, the collections manager of lichens at the Duke University Herbarium. Duke researchers are exploring how lichen symbionts communicate with each other. Top: Jessica Allen and James Lendemer call this crustose lichen “American sunrise,” for its orange fruiting bodies, or sexual structures. Found in the hotspot, its species name is Brigantiaea leucoxantha. Photo by Jessica Allen. 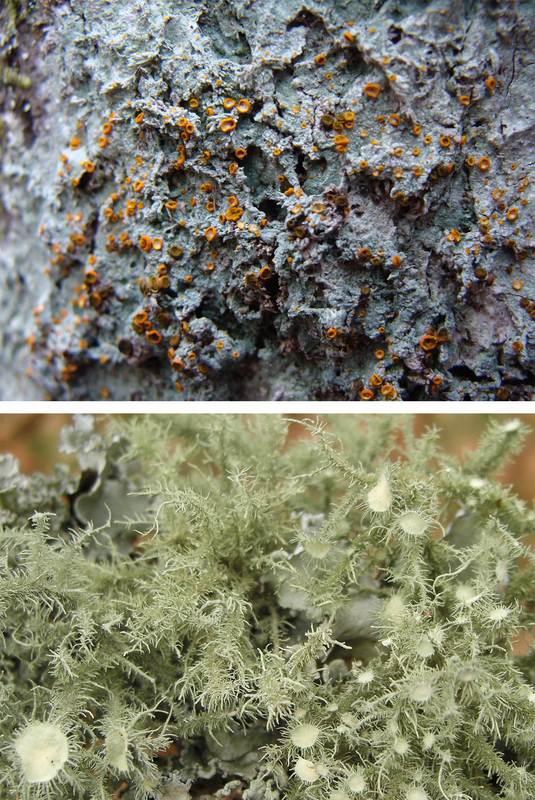 Bottom: The fruticose lichen Usnea strigosa is susceptible to air pollution and won’t thrive in city environments. It grows on the canopy branches of trees, and you might spy it on fallen branches along trails. Photo by Jason Hollinger/CC BY-SA 4.0. Lichens are classified by their primary fungal component. That fungus largely influences the form a given lichen takes, which, generally speaking, ranges from flat and leafy (foliose), to shrubby (fruticose), to crusty (crustose). But there’s much more to lichens than their main characters. They’re small worlds unto themselves, brimming with tiny organisms such as mites, nematodes, tardigrades — also known as water bears— and plenty more fungi and bacteria, Allen explains. “It’s like a community of people living in a co-op,” Lendemer says. What roles those other dwellers play in the lichen community is an active field of study. For instance, work led by researchers in Austria suggests that bacteria contained within a species known as the lung lichen could help it absorb nutrients and resist pathogens, among other functions. Unlike plants, lichens have no roots. They instead absorb various essential nutrients and moisture from their surroundings, directly through their outer layer, called the cortex. Nor do lichens sport a protective waxy coating. As a result, they can’t keep airborne pollutants out of their tissues, and most species are sensitive to air pollution. 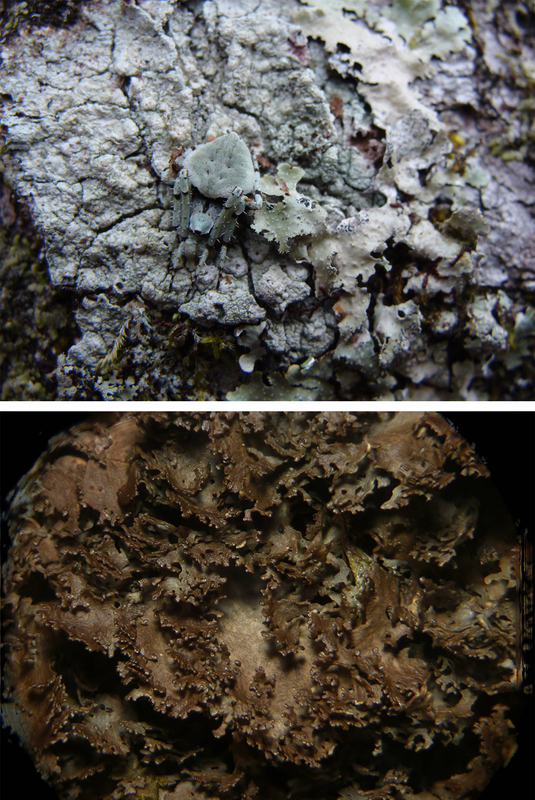 “Lichens are really useful as environmental indicators,” LaGreca says. Lichens perform ecosystem services as well. For instance, “they’re one of the most important natural fertilizers of forests,” Allen says. “Lichens with cyanobacteria contribute kilograms of nitrogen to those systems.” They also absorb carbon dioxide from the atmosphere in order to photosynthesize, producing oxygen in the process. North America’s “crown jewel” of lichens is the Southern Appa- lachian Mountains, Lendemer says. But as it turns out, the Albemarle- Pamlico peninsula and nearby areas offer their own lichen trove. In 2012, Allen, Lendemer and colleagues began inventorying lichen along the Mid-Atlantic coastal plain, stretching from New Jersey into Georgia. During the project, it became clear that North Carolina harbored much higher levels of lichen diversity than expected, concentrated in forested wetlands along the Alligator River. “The sheer number of individuals is fantastic. Trees just coated in lichens, and [lichens] falling out of the trees and on the ground everywhere. It’s wonderful,” Allen sighs rhapsodically. 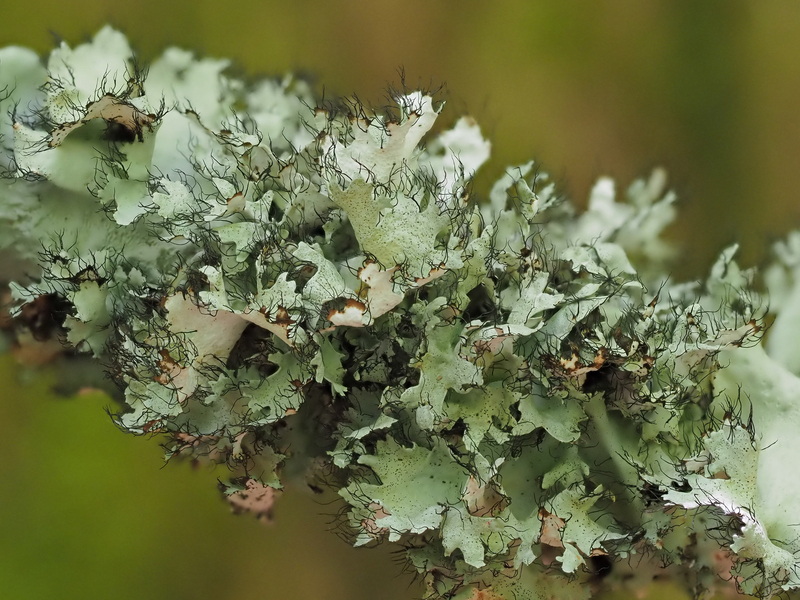 Allen and Lendemer first characterized this bevy of lichen in the journal BioScience in 2014. Two years and more sampling later, Lendemer and colleagues published an extensive review of the hotspot, which essentially includes the N.C. counties of Currituck, Dare, Hyde, Tyrrell and Washington, along with a portion of Camden. Top: A spider nestles inconspicuously next to the foliose lichen Punctelia rudecta and on top of a crustose species in the genus Pertusaria, both found in the hotspot. Photo by Jessica Allen. Bottom: The foliose lichen Sticta deyana is nearly endemic to mature inland swamp forests of the hotspot. Otherwise, it’s known from a single mature hardwood forest in Alabama. Photo by Jason Hollinger. Of approximately 5,000 samples collected from about 50 sites in the region, the richest biodiversity occurred in low-lying swamp forests, followed by maritime forests, the researchers reported in the journal Castanea. In total, the samples represented more than 380 taxa — several of which were new to science. The overwhelming majority were crustose lichens. “This place hosts some of the last large populations of species that we either now find nowhere else, or [that] are now extremely rare other places when they were once more widespread in the past,” Lendemer says. Meanwhile, nearly a quarter of the samples were represented by only one specimen, suggesting that many species are rare even to the hotspot. Two species appeared to be endemic to the area, including Albemarlea pamlicoensis, collected from Bull Neck Swamp, which is managed by NC State University’s College of Natural Resources. To the naked eye, the species appears as inconspicuously small, reddish-brown dots. But “it’s very distinctive microscopically,” Lendemer assures. Uncoincidentally, the hotspot encompasses the largest remaining contiguous protected natural areas in the Mid-Atlantic Coastal Plain from southern New Jersey to southern South Carolina, according to the researchers. Alligator National Wildlife Refuge and Pocosin Lakes National Wildlife Refuge make up the bulk of this haven. And lichen like pristine habitat. “It’s just exactly the sort of place you’d expect to find high diversity — long ecological continuity, places that haven’t been disturbed, and places that have relatively clean air,” says Rebecca Yahr, a lichenologist at the Royal Botanical Garden Edinburgh, who has collected lichen along North Carolina’s coastal plain. The extensive swamp habitats likely also provide coastal plain lichens with an abundance of “microhabitats” — that is, tiny ecological niches — in which to thrive. For instance, the topography of tree bark, wind shear, humidity and shadiness are all factors that can influence which lichens settle where. But another factor also likely plays into the lichen variety observed in the coastal plain. Cape Hatteras marks the dividing line between two biogeographic regions. In other words, “we’re at the southern extent of the northern species range, and at the northern extent of the southern species range,” explains Terri Kirby Hathaway, a marine education specialist with North Carolina Sea Grant. For instance, along the N.C. coast you can find both spiny lobster — a tropical species — and Maine lobster, as well as northern and southern bayberry. A look at the National Oceanic and Atmospheric Administration’s Sea Level Rise Viewer, which draws on data from NOAA tide gauges, suggests that the sea could rise around Duck, in Dare County, by as much as 3.5 feet by 2050. Already forests in the Albemarle-Pamlico peninsula are succumbing to saltwater intrusion, and Allen and Lendemer worry about the future of North Carolina’s coastal lichens. For many species, this hotspot is a last bastion. As a conservation measure, transplanting lichen must be strategic. “If you move them into a place where the habitat is markedly different, then they’ll suffer. If you move them into a place where there’s terrible air pollution, then they die,” Yahr says. Identifying suitable new habitat and managing it properly is crucial, she says. Allen agrees. “Really, what we need to be doing now is preparing, so like planting and preserving land inland so the forest can start to mature somewhat so these species can move,” she says. 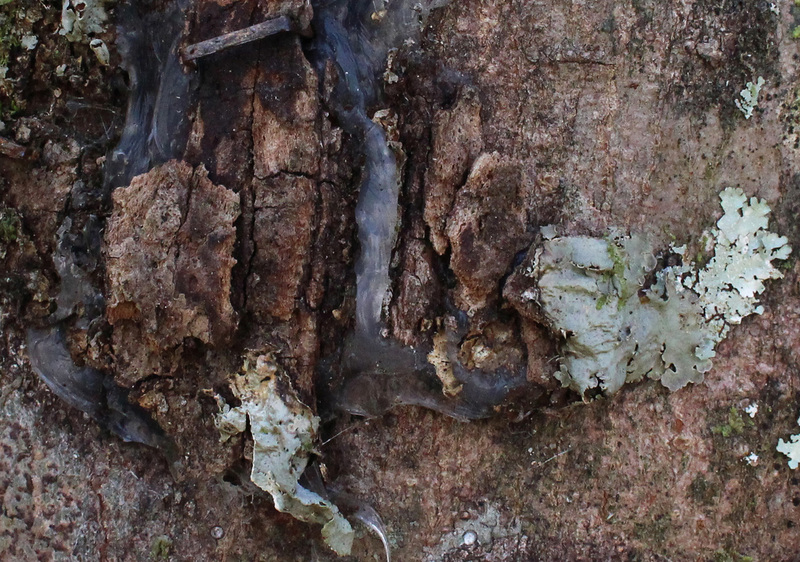 James Lendemer was excited to see that a transplant of the foliose lichen Lobaria ravenelii — visible here as darker green — had creeped onto its substrate. Photo by Julie Leibach. Back in Bull Neck Swamp, Lendemer is getting anxious to see if a transplant of a relatively rare cyanobacterial lichen removed from an evergreen tree has established on a deciduous red maple. Known by the rather unappealing common name Ravenel’s lung lichen (Lobaria ravenelii), “it’s one of the prettiest lichens around,” Allen attests. Examining the tree, Lendemer is at first crestfallen. A large smear of silicon sealant suggests that the transplant has bit the dust, so to speak. “Although, look!” Lendemer suddenly exclaims. Upon closer inspection, it’s apparent that the dark green, leafy lichen isn’t entirely gone. In fact, a portion has migrated onto the maple bark. The new growth is a little ray of hope for the researchers, who anticipate that their project will take another year or two to complete. 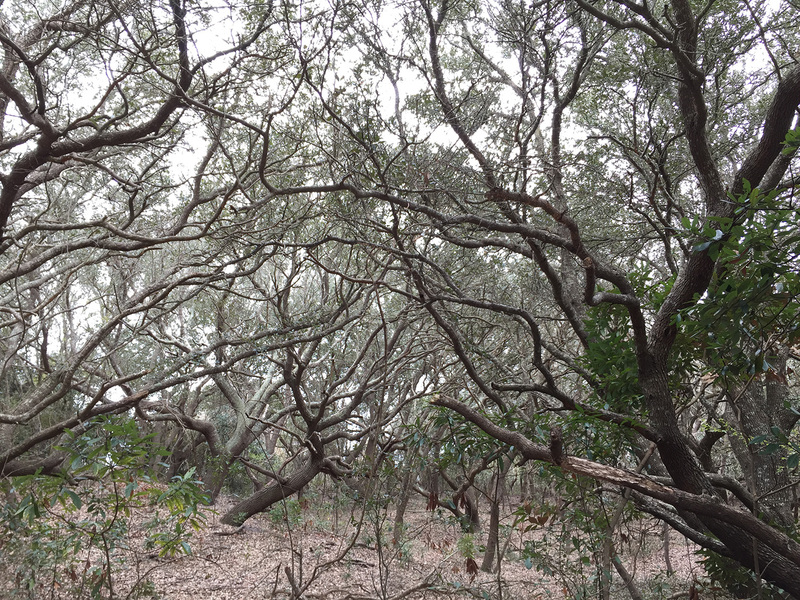 Live oak trees thrive at Pine Island Audubon Sanctuary. Photo by Julie Leibach. Want to see coastal N.C. lichen but don’t care to tromp through a swamp? Try the Nature Trail at Pine Island Audubon Sanctuary in the Outer Banks. The public path is 2.5 miles one way, and courses between Duck and Corolla. In terms of habitat, “it’s primarily maritime forest or maritime shrub” dominated by live oak, says Robbie Fearn, sanctuary director and a former partner on a Community Collaborative Research Grant project, supported by North Carolina Sea Grant in partnership with NC State’s William R. Kenan Jr. Institute for Engineering, Technology and Science. Walking along Audubon’s nature trail, “you see these sort of mappy patches all over the limbs of the live oaks,” Fearn says, while the limb tips appear fuzzy with other lichen species. Lichenologist James Lendemer of the New York Botanical Garden has surveyed Pine Island Audubon Sanctuary as part of a larger lichen inventory. “It’s a really nice typical assemblage of the lichens you would see in a maritime forest on the Outer Banks,” he says. Pine Island Audubon Sanctuary is generally closed to the public, but the trail is open to everyone from dawn to dusk, 365 days a year. Park at the Pine Island Racquet and Fitness Center on N.C. 12 for easiest access. Learn more at pineisland.audubon.org/visit/landing/nature-trail.